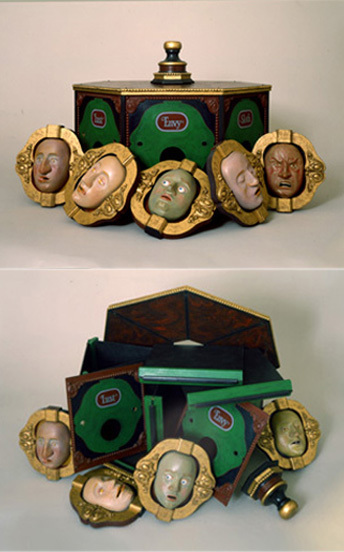 The Seven Deadly Sins: a seven sided box, each side with a near life size mask of one of the deadly sins on it. 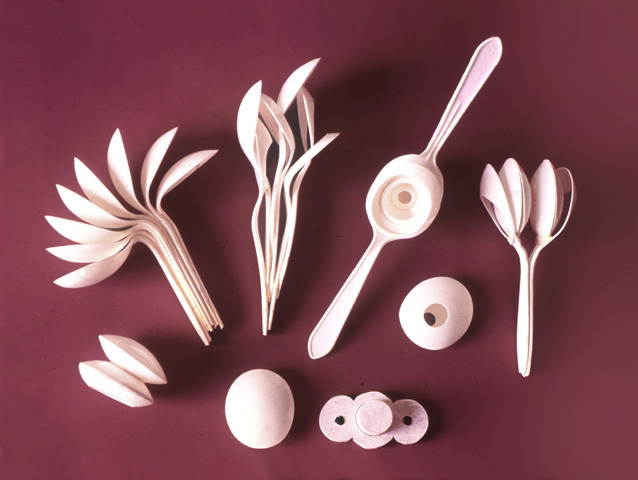 The masks are removable, and the box can be disassembled. 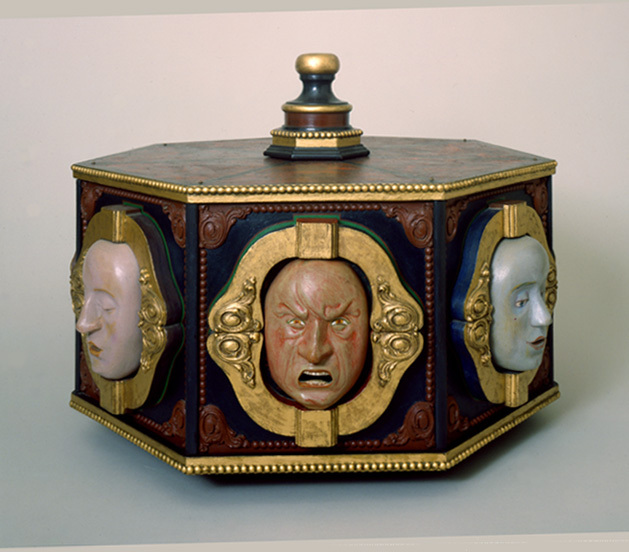 Behind each mask is an opening, and the mouths of the masks are open, so that notes can be dropped through the mouths into the sections of the box behind them, informing on sinners in different categories. 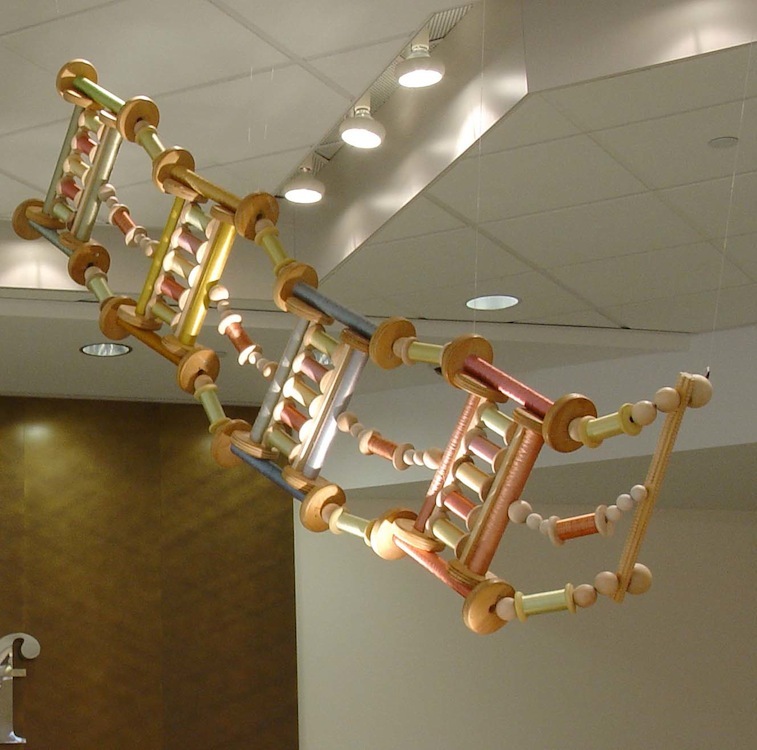 I have often thought this sculpture would find a good home at the center of the United States Capitol Rotunda. 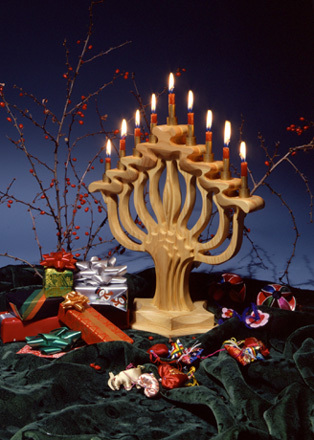 Wood, carvings, composition material. About 30" across. 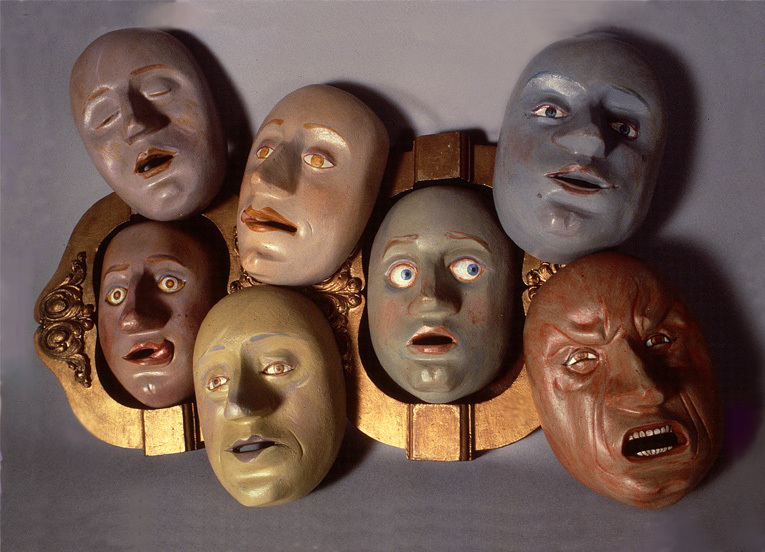 Seven Deadly Sins, the Masks: From upper left, clockwise, the faces of the sins: Sloth (violet), Lust (flesh tone or peach), Envy (green), Pride (blue), Anger (red), Avarice (yellow) and Gluttony (red-purple). 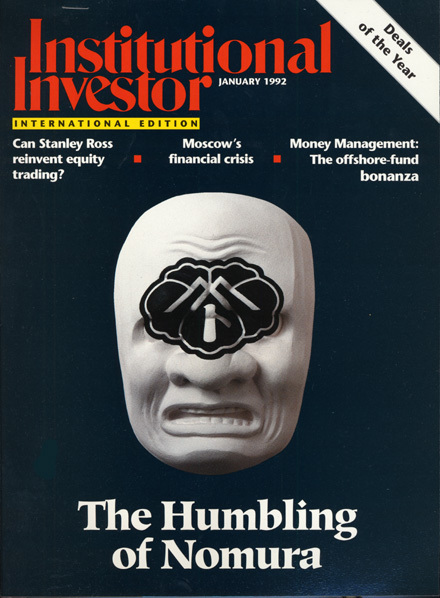 The Humbling of Nomura: my version of a traditional Japanese Noh mask, with the crest of The Nomura firm, indicted for cheating many thousands of clients out of their savings. 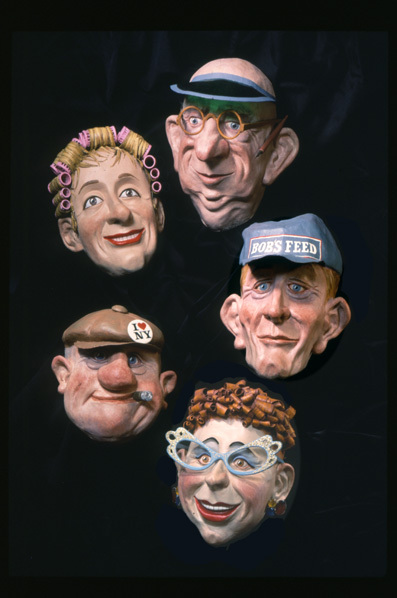 Reader's Digest Masks: done for an advertisement for the famous digest magazine, titled "Reader's Digest readers Unmasked", the message was that while the public image of RD readers is of non-intellectuals, farmers, cabbies, housewives, the reality is that RD readers are highly educated and successful business owners and professionals. Vegetable and Fruit Person: done for a Discover magazine cover, later a book cover, on healthy eating habits. 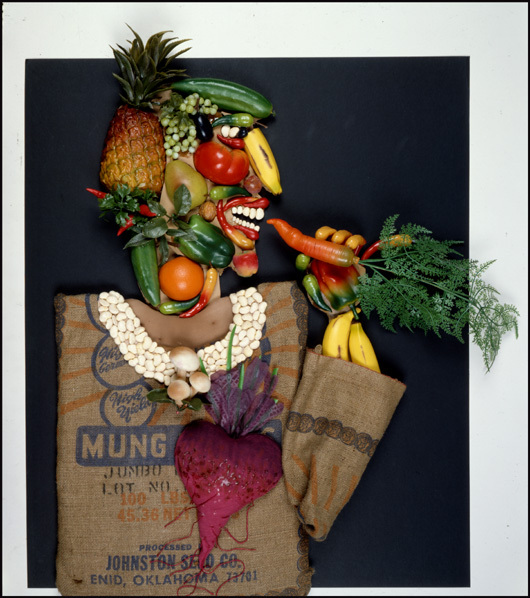 "Person" made Arcimboldo-style from plastic fruits and vegetables, plus a mung bean sack. 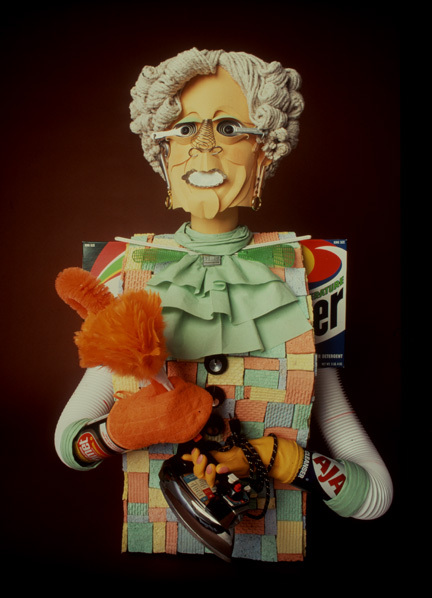 Mrs. Ms.: assemblage woman made of household cleaning and cooking utensils, done for a Ms. Magazine story on the never-ending obligations of homemaking on professional women. 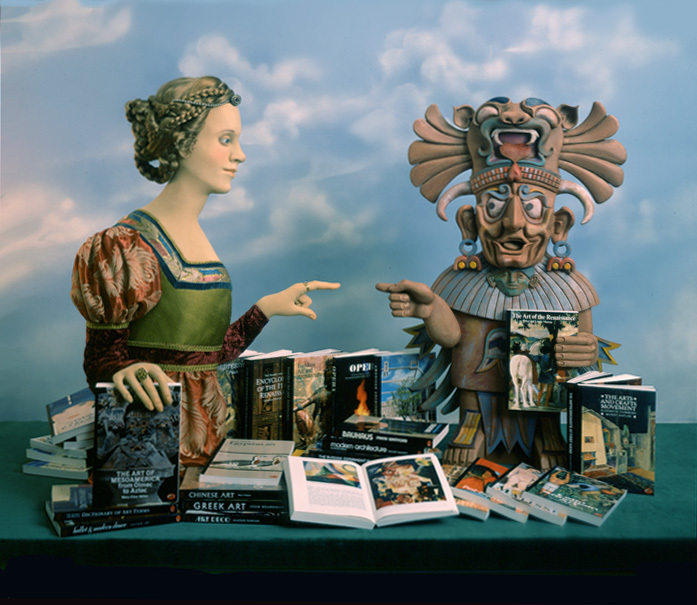 Renaissance Lady/Aztec Man: soft sculpture, wood, and carved hard foam life size figures done for a poster advertising the many and varied art books published by Thames and Hudson. 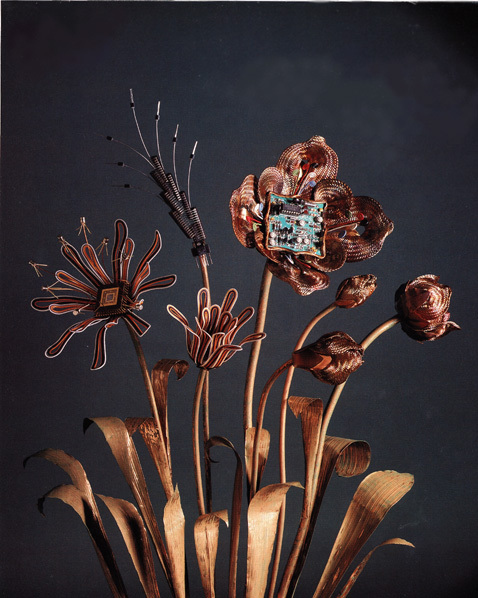 They wanted to emphasize that they have publications for subjects as far apart as 15th century Italian and Pre-Columbian art. 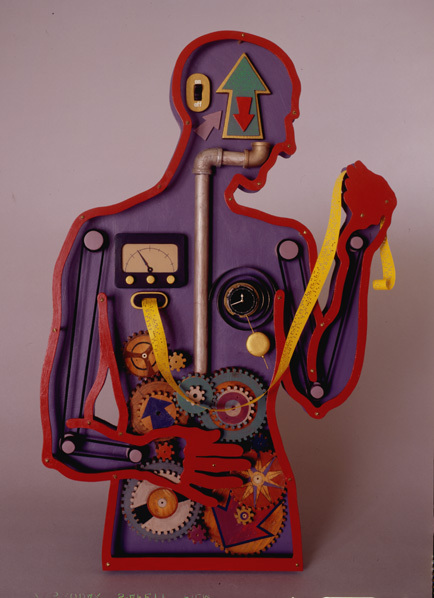 Be in Touch With Your Body: wood and found object sculpture for In Flight magazine, illustrating a digest of Norman Cousins' famous memoir on his own self=cure from a debilitating disease. 28" tall. Medicine Cabinet Family: illustration for Family Magazine, old fashioned medicine cabinet (with a lot of hand done graining) sheltering a little wood family and containing many useful home remedies. 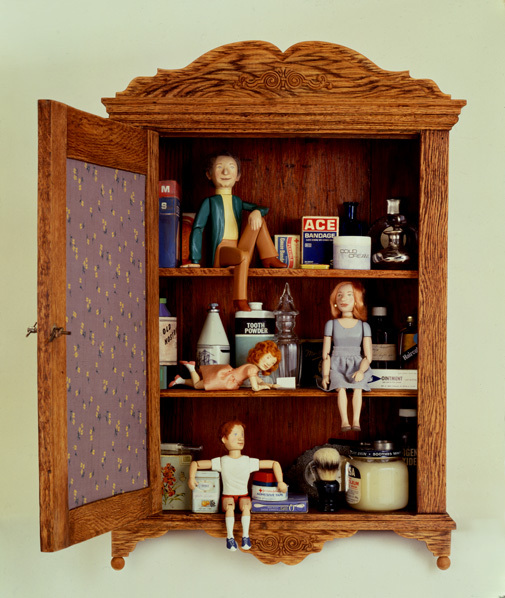 The point of the article was that one can often find good remedies in the home, without needing to go to the doctor. 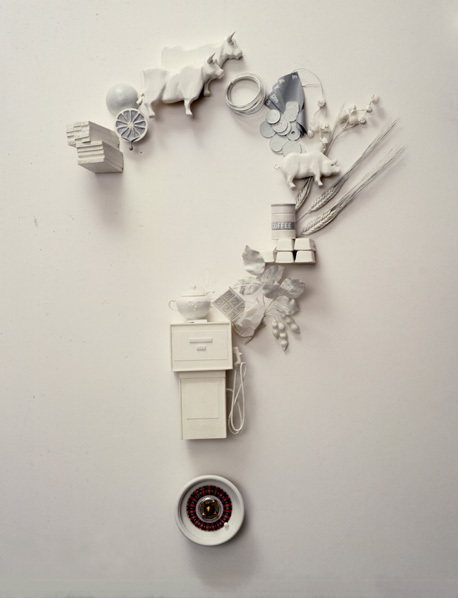 Commodities Question Mark: White on white whittled commodity symbols, culminating in a toy roulette wheel at the bottom. 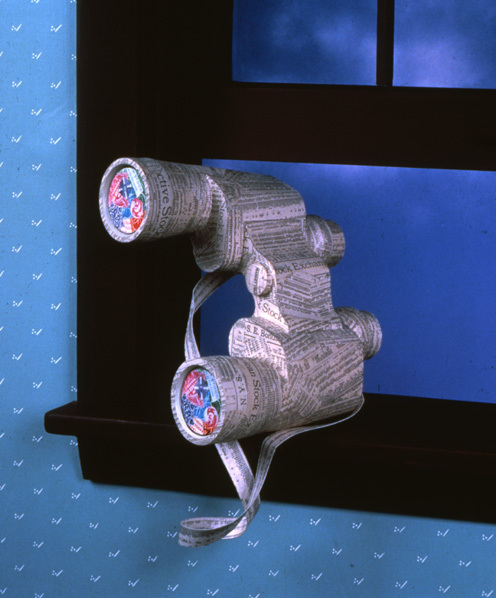 Article described the uncertainty of commodities markets. 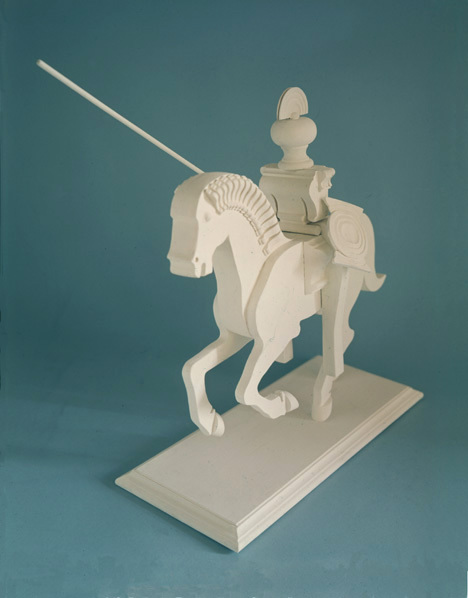 30" tall..
White Knight: Wood, wood moldings and carvings and assorted parts, This was made for part of an annual report for the American Gas Association. 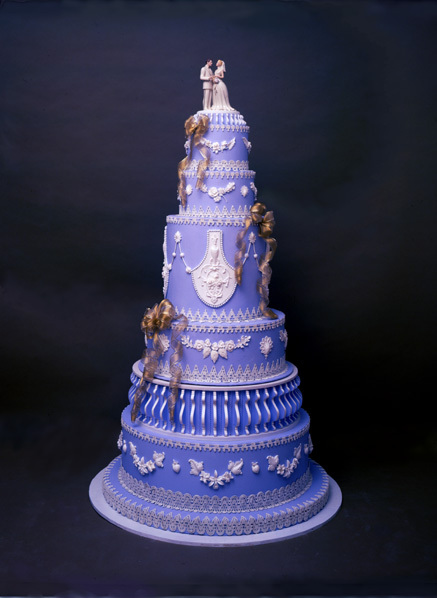 26" tall. 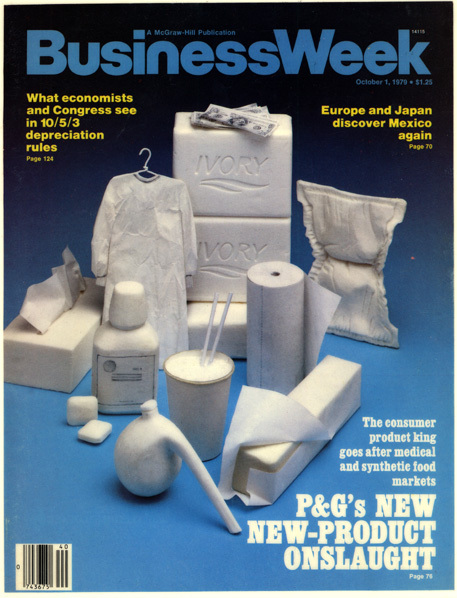 Proctor and Gamble Soap Sculpture: illustrating a cover story on the famous maker of Ivory Soap. 30" tall. 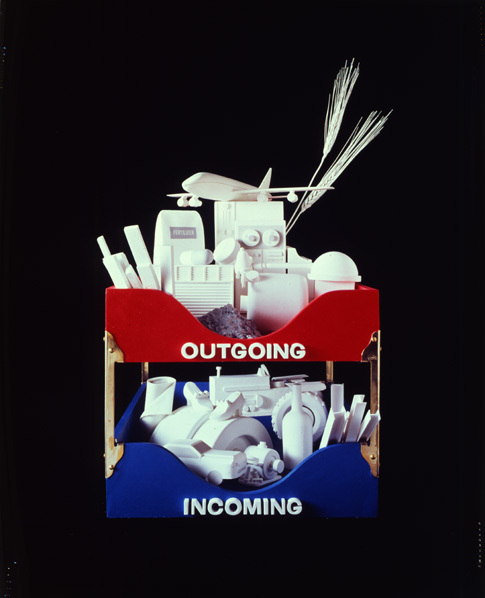 In/Out Box: white on white wood sculpture with real in/out box, showing the imports and exports of the United States Done for Fortune Magazine, about 28" tall. stock certificates, done as illustration for medical industry brochure. 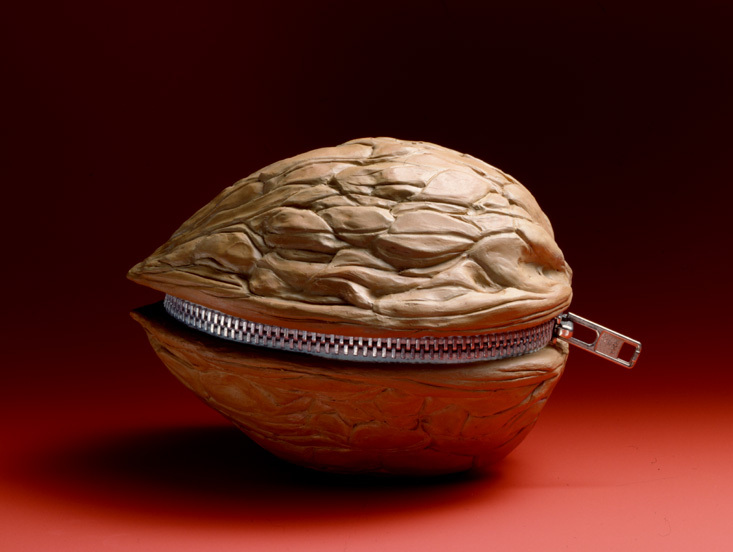 Zippered Walnut: Large walnut modeled in art clay, with industrial size zipper, advertisement for drug company. 6" long. 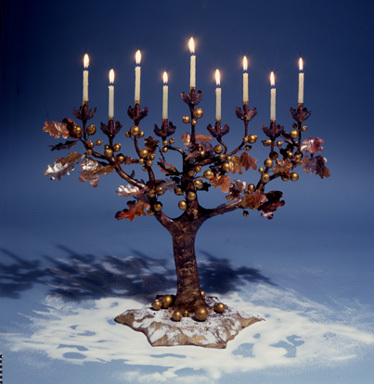 Three Menorahs: From left, Hi-Tech, Tree of Life, and Carved Wood: assemblage of wood, metal parts, found objects, illustration for woman's magazine as craft project. 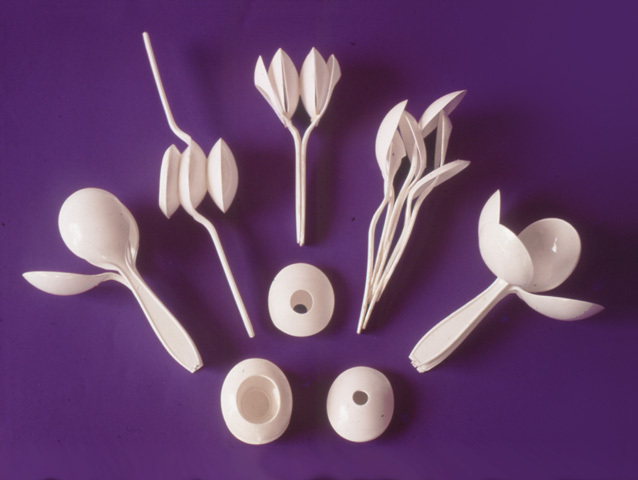 Spoonflowers, or Tea Set for a Martian: white plastic soup spoons, drilled, sanded, bent and distorted. For fun. 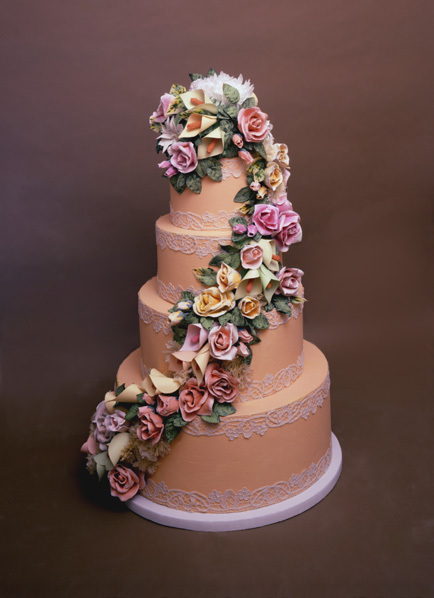 Fabulous Wedding Cakes: 5' tall blue and 4' tall peach color cakes made of hard foam, lace, composition, and resin-cast flowers and leaves, for wedding display for Fortunoff's 5th Avenue New York store. 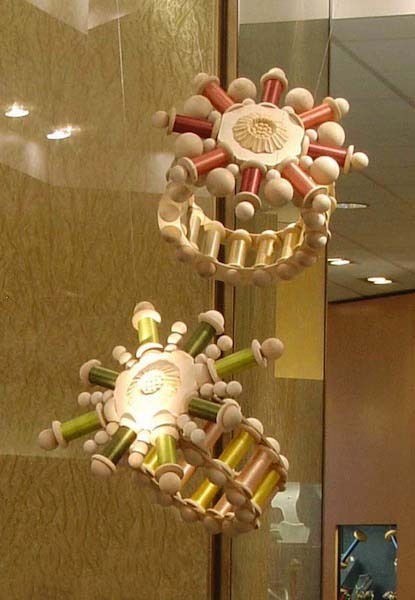 Giant rings, bracelet, earrings, and necklace made for a Fortunoff jewelry store display. 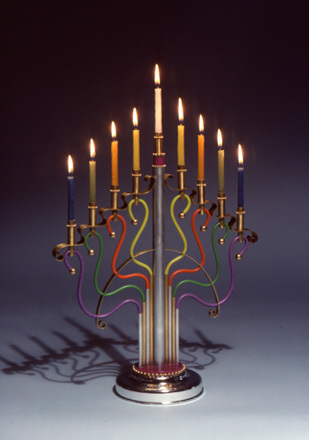 The materials were a group of spools wound with various colors of silk thread, remaindered from Scalamandre silks. 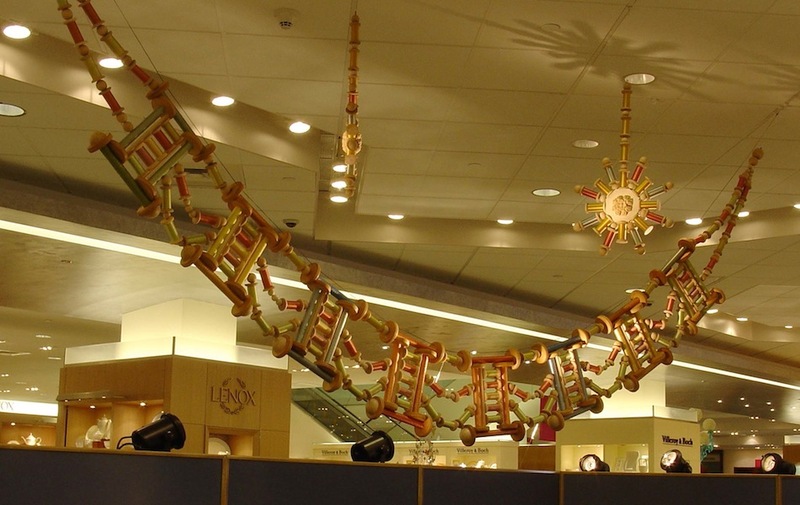 The Creative Director for Fortunoff bought them in bulk and asked us to make giant jewelry from them as a display. We added wooden balls, hemispheres, and wood medallions. 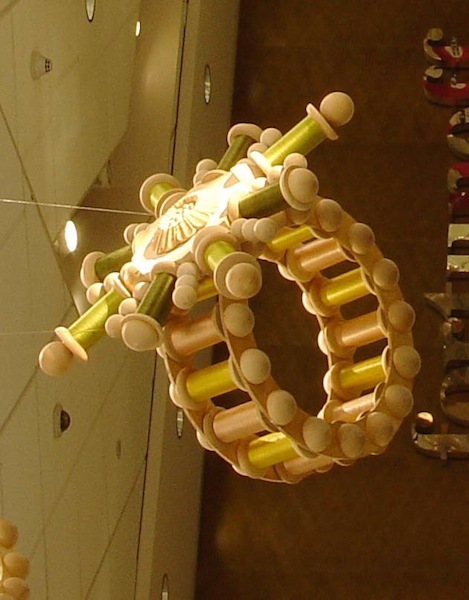 Giant bracelet made from wood spools wound with silk thread, wood balls, and various other wood parts. 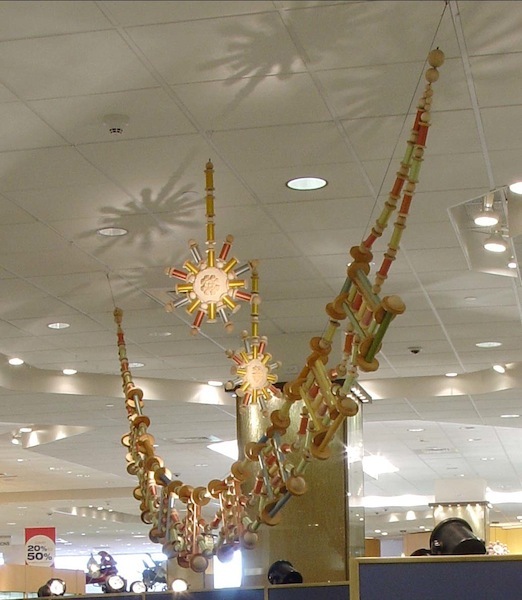 Giant brooch made with a medallion at the top, and hanging spools and wood balls. 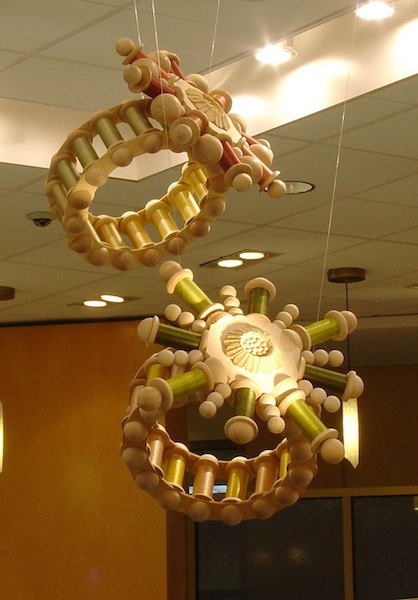 Giant necklace and earrings made from wooden spools wound with silk thread, various sizes of wood balls and hemispheres. Giant Necklace and earrings, another view. These items were about ten times normal size jewelry.